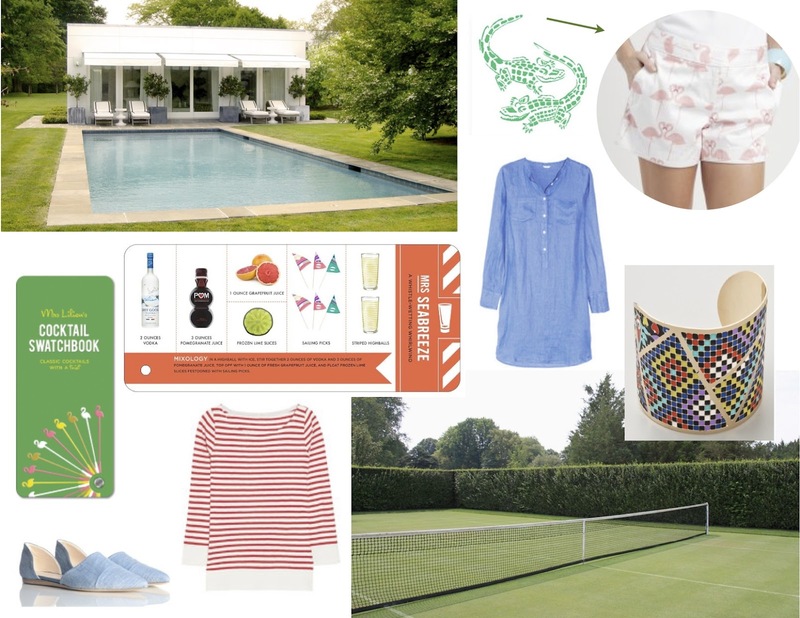 How Perfect is this look for summer? Dead-on. I'm on the hunt for some vintage statement jewelry. How amazing is the piece above!? Atlantis Home Goods has a nice vintage section. Does anyone have any other reccomendations? Also, may I please live in a world where these little Chanel booties are a reality? 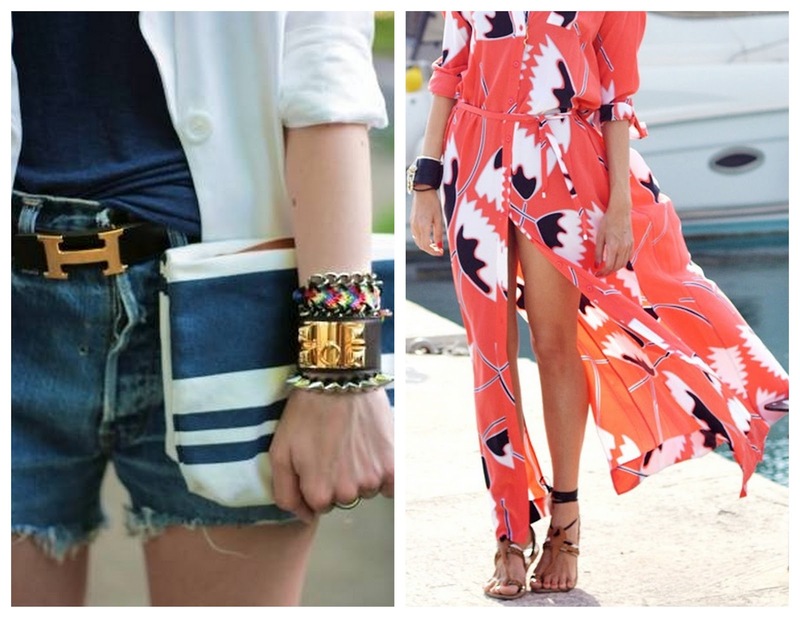 I recently pinned the above left image and was struck by the juxtaposition of the long flowy maxi with the comfy converse kicks. It not only got me thinking about whether I could pull off the look but more importantly the image reminded me of how comfortable maxi dresses are! I set out to find a cute one and DIED over this Ella Maxi Dress by BCBGMAXAZRIA. The colors are perfect and the silhouette is so interesting. I haven't seen an intricate neckline like this on a maxi before. Unfortunately, the unique printed chiffon- boasting accordian pleats and an illusion neckline, will cost you a pretty penny. Have you Jen Lake on the Everygirl? There are so many girly pops of pink in the feature. From Jen's skirt (on major sale here), her necklace, the "love" bookends to the flowers. From another angle- pink reigns supreme in her office. 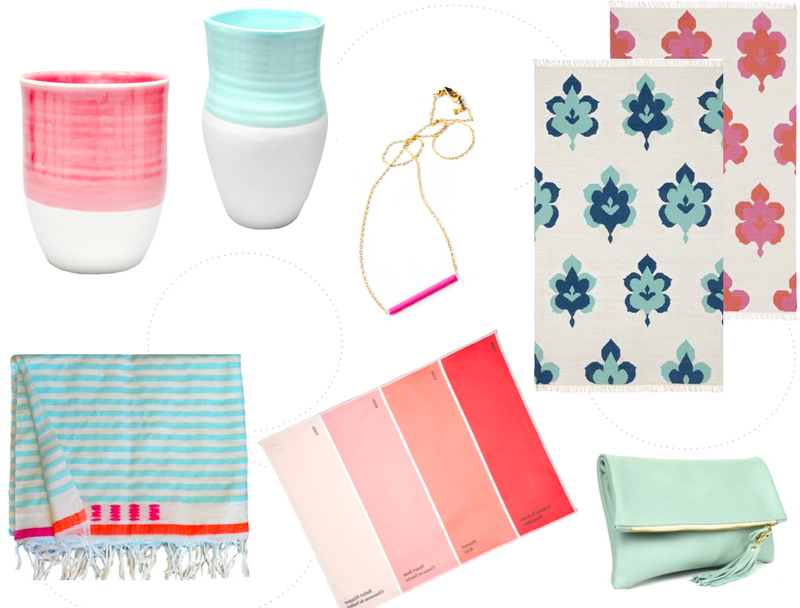 Pink gumballs and a geometric throw carry the color throughout the space. 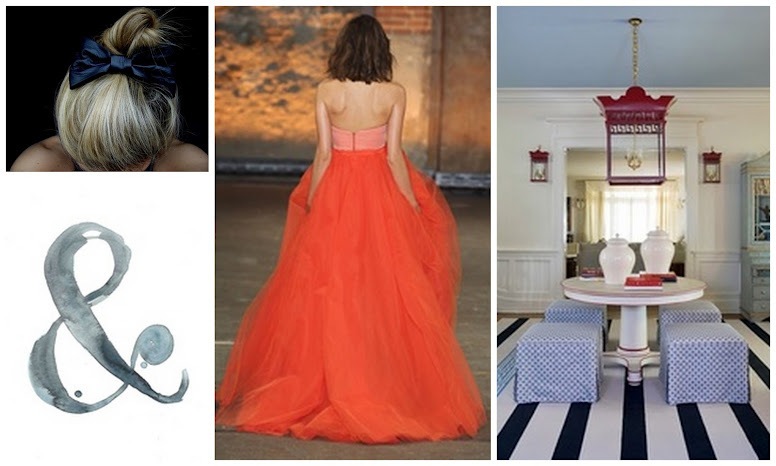 Fashion and decor mimic one another above. Playful pink stripes and tweed are balanced out by a chunky ring (purchase here) and studded Christian Louboutin heels. ps- so happy to have reached 400 followers! Today I'm over on The Peak of Tres Chic participating in a fun series called "Who What Wear Where". I'll share my perfect day. Who would be there, what would we do, what clothing would I wear, and where would this day take place? Head on over to Sam's blog to check it out the post here! The most exquisite blue velvet couch! Suddenly I "need" a blue velvet chaise lounge- because that's practical. Those stellar blue heels and what looks like a hockey jersey worn during fashion week. I love it but it reads less couture and more classic walk of shame. similar dress in white here. Summer is in full swing! Here are a few of my essentials for this time of year. 1. Loving these Elizabeth McKay Hayden shorts. I spotted them at a local boutique the other day in the flamingo and alligator patterns. 2. The linen henly tunic is the perfect neutral beach cover up. A full day in the sun calls for long sleeves. It's so nice to have the option to cover up after too much sun. It's also a plus to have a little extra warmth during those lasts moments on the beach as you watch the sunset. 3. Punches of color are perfect for summer. Make a statement with the hacienda cuff. 4. Looking to try some fresh libations? Check out Mrs. Lilien's new Cocktail Swatchbook. It even boasts coated waterproof pages that make it perfect for poolside service. 5. Jenni Kayne Chambray d' Orsay Flats- perfection. Need I say more? 6. The perfect little nautical shirt. Throw it on over your bathing suit, with jorts, or even white denim. I have blue but love the idea of red. 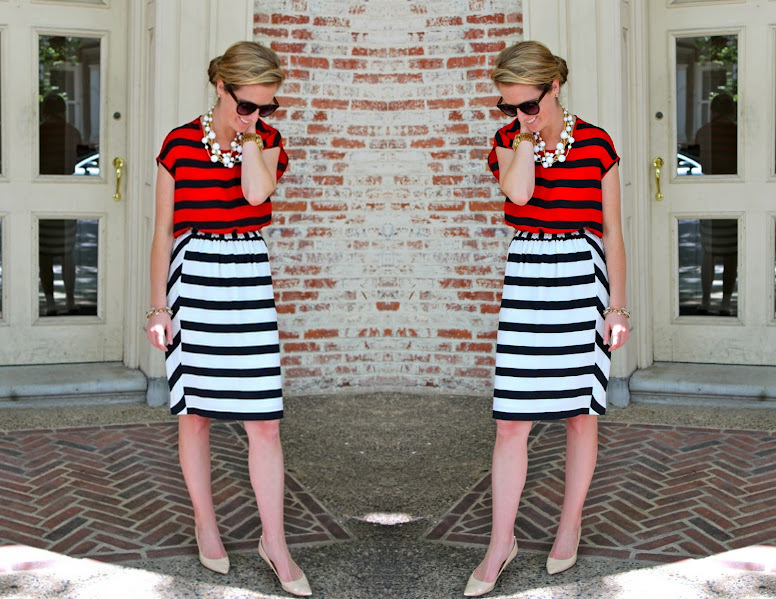 You can never have too many stripes! Totally worthy of a repost- have you seen Catherine's home tour featured today on Glitter Guide? This space is heaven! 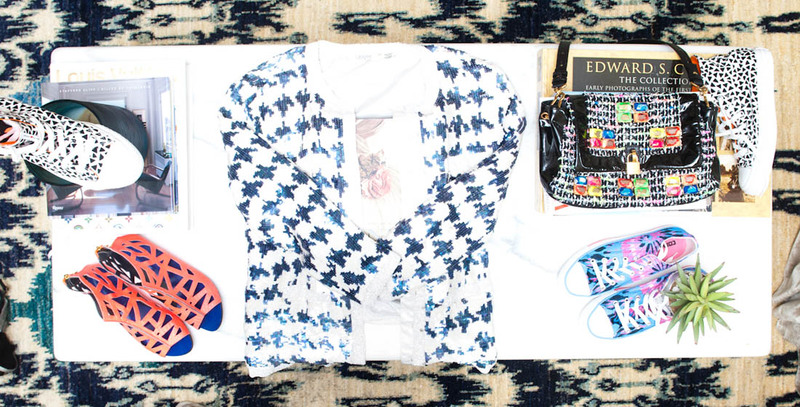 Bright, fresh, yet eclectic. She has an authentic style that includes quirky and whimsical elements. Also, any girl who can pull off a tutu and not look like she's channelling Carrie Bradshaw is golden in my book. 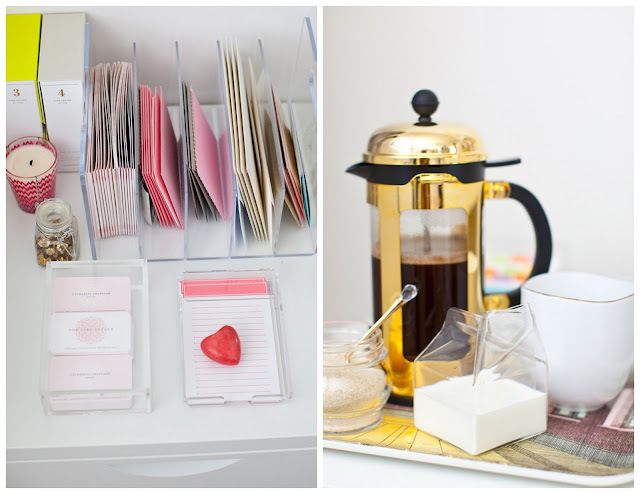 An organized workspace prepped for handwritten notes, and fresh coffee styled with the cutest lucite milk carton (find it here). The perfect whimsical detail. Has anyone ever read the children's book "All My Friends Are Dead"? I can't look at a Dinosaur without being reminded of it. Also of note... everything is coolor when stored or served in a mason jar. Fact. The shoes... the rug... the lucite coffee table. Check out the entire feature here. I'm working on purchasing a few simple pieces for my wardrobe. I'm the type of person who literally doesn't own a plain white tee (que "hey there delilah..") so I purchased one this weekend (find it here). I'm thinking I should also incorporate the above peplum top so I decided to style it two ways. As my tastes evolve I've found that I am drawn to spaces with masculine influences. A few years ago that would not be the case. 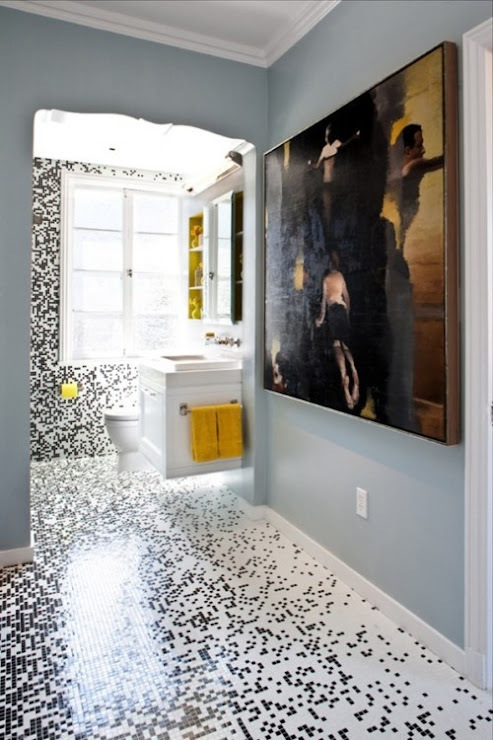 Above, I love the stark white wainscoting paired against the dark stained floors, mirrored ceiling, and dark walls. This tile formation is phenomenal! The artwork absolutely makes the space. Again, it's little darker then what I would naturally gravitate to. Nevertheless, I love it. 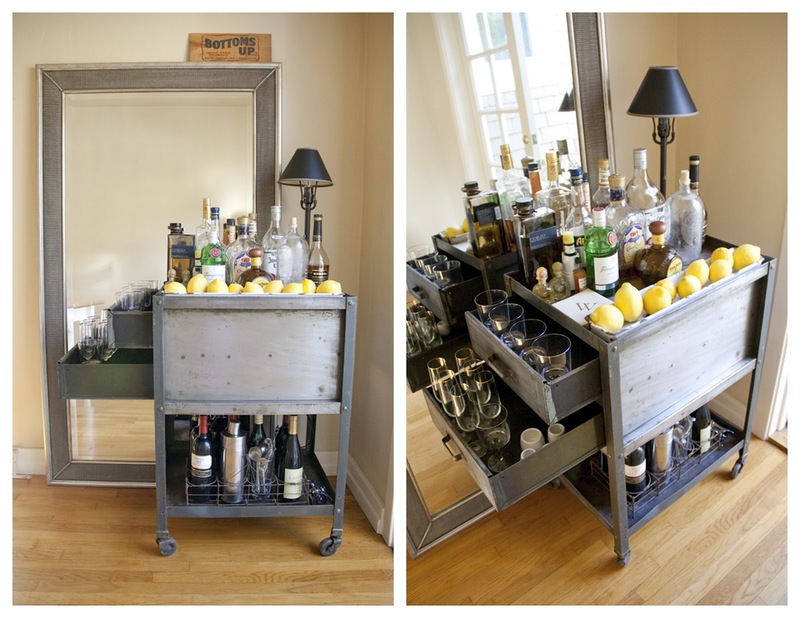 Have you seen this bar cart perfection over on could i have that? Samantha used a vintage steel side table from the 1930's. This flea market find just needed a little imagination to make it into the perfect bar cart. I love how Samantha pulled out the drawers to house glassware! The fresh whole lemons add color and warmth to what could be an austere looking bar. I'm usually drawn to a more feminine silhouette adorned with fresh flowers but this industrial chic option is lovely. Have you found that your design aesthetic has changed over time? Lately, I'm really drawn to shoes. They can change the entire tone of a look. 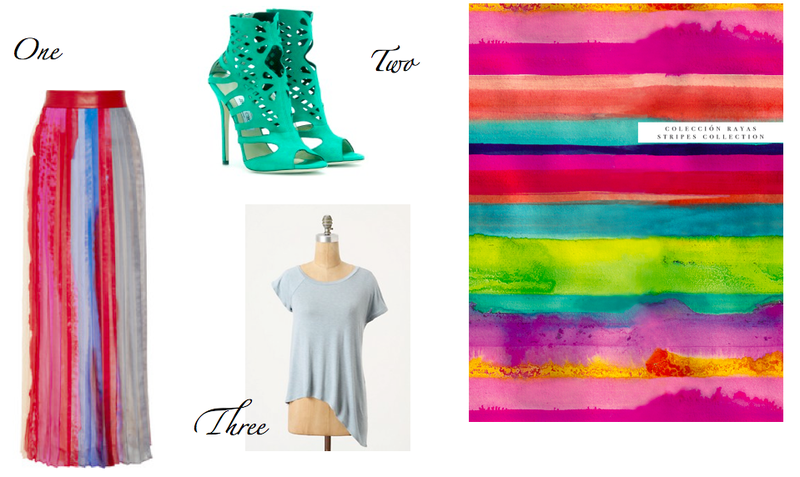 A pair of statement heels can dress up a relaxed ensemble such as jeans and a tee. Conversely, your footwear can quickly tone things down. Why not keep a silk dress simple with some flats or espadrilles? Above are are a few of my current loves. 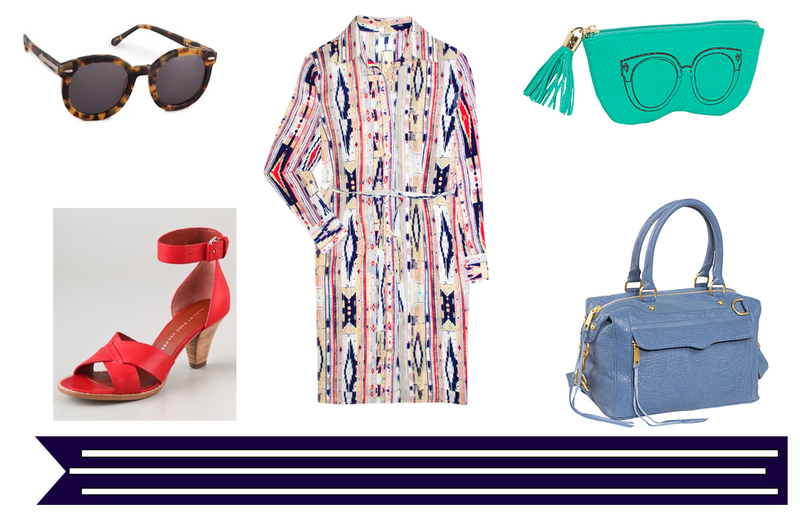 The summer season is a perfect excuse to wear copious amounts of color. I would pop the color on the shirt dress and keep the jewelry simple. An oldie but one of my favorite songs to listen to with the windows down and sunroof open. One must turn it up so loud that you have to scream over the music to sing along (yes, I do this- no shame). In awe of Mary J Blige, the girls got pipes! I love the Madewell sale section. I dropped in the other day and found a few great items. This look feels nautical which works for me as I have full intentions of hitting my stride with regards to slipping into "summer mode". I absolutely love a drop waist on a dress! I previously pinned the yellow look and used it as inspiration for the above outfit. The affordable red option, has the perfect pop of color for the playful silhouette. I've always loved the way colors blend and bleed together in watercolors. I pinned the above image a while ago and was immediately reminded of it when I first saw the above chiffon maxi skirt. I love the punch of green in the original image so I paired the skirt with these killer Jimmy Choo boots. I kept the color scheme neutral with the tee but feel that it's asymmetric silhouette holds up nicely against the other high styled items. I'm really enjoying soft hues for summer. The sudden surge in heat is making me crave simple, airy, tones. These over-the-top girly pinks and blues are calming yet fresh. I'll take one of each please!